R.O.O.T.S. 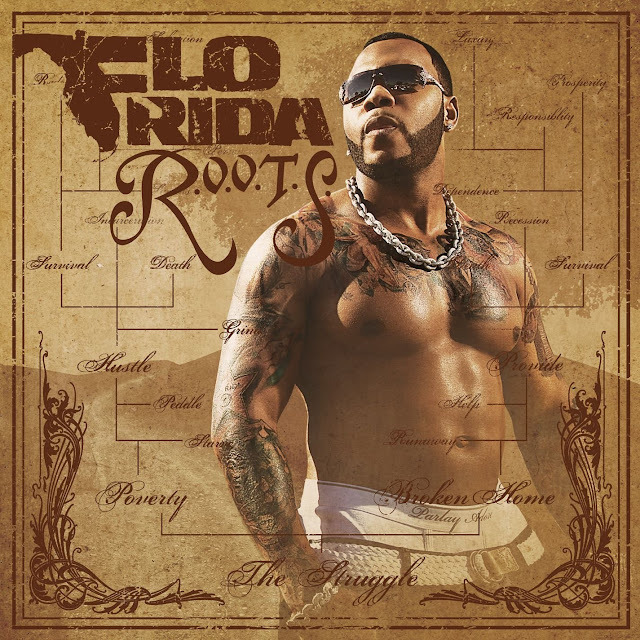 (prescurtare de la Route of Overcoming the Struggle) este cel de-al 2-lea album al lui Flo Rida și a fost lansat în data de 31 martie 2009, prin Poe Boy / Atlantic. 1. "Finally Here" Drumma Boy & The Beat Bullies (co-produced by Christopher "Spitfiya" Lanier) 4:02 Recreates elements from "Bounce" performed by Timbaland. 2. "Jump" Mike Caren & Olige E.Dean (drums by Travis Barker) Nelly Furtado 3:28 Co-Wrote and Background vocals by Esther Dean. 3. "Gotta Get It (Dancer)" Mike Caren, DJ Frank E & Oligee 4:44 Recreates elements from "Private Dancer" performed by Tina Turner. 4. "Shone" Jim Jonsin & Dre & Vidal Pleasure P 4:15 Recreates elements from "Be Good to Me" performed by Ashley Tisdale. 5. "Right Round" Dr. Luke Ke$ha 3:22 Recreates elements from "You Spin Me Round (Like a Record)" performed by Dead or Alive. 7. "Be on You" Stargate (co-produced by Ne-Yo) Ne-Yo 4:03 Recreates elements from "Viva La Vida" by Coldplay. 8. "Mind on My Money" Eric Hudson 3:31 Background vocals by Noel "Detail" Fisher. 9. "Available" will.i.am Akon 4:24 Samples excerpts from "Take Your Time (Do It Right)" performed by SOS Band. Additional vocals by Natalia Cappuccini. Benny Blanco Ke$ha 3:10 Recreates elements from "Satisfaction" performed by Benny Benassi. 11. "Never" Happy Perez 4:21 Background vocals by Bonnie McKee. 12. "Sugar" DJ Montay (co-produced by Mike Caren) Wynter Gordon 4:12 Contains musical parts from "Blue (Da Ba Dee)" performed by Eiffel 65. 13. "Rewind" The Inkredibles Wyclef Jean 4:29 Recreates elements from "Where Is the Love?" performed by Black Eyed Peas.